So now I am really regretting that I didn't get a chance to see Nas' TIME IS ILLMATIC at the Tribeca Film Festival last month. Today brings the news that the documentary, which tells the story of the rapper's journey to create his 1994 iconic debut album, Illmatic, has been acquired by Tribeca Film. Tribeca Film is planning a simultaneous theatrical and VOD release in October, along with performances by Nas in select cities. In addition to that, educational youth screening series will complement the release. Time Is Illmatic traces Nas’ influences and the insurmountable odds he faced in creating the greatest work of music from hip-hop’s second golden era. 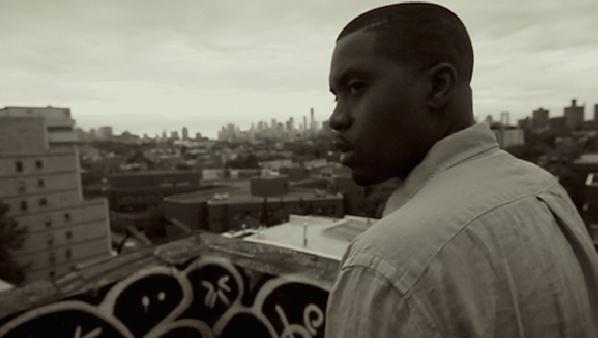 The film tracks the musical legacy of the Jones family -- handed down to Nas from his jazz musician father, Olu Dara, the support of his Queensbridge neighborhood crew, and the loyalty of his younger brother Jabari “Jungle” Jones. Twenty years after its release, Illmatic is widely recognized as a hip-hop benchmark that encapsulates the sociopolitical outlook, enduring spirit, and collective angst of a generation of young men searching for their voice in America. The documentary is directed by multimedia artist, One9, written by Erik Parker, and produced by One9, Parker, and Anthony Saleh. Nas seems pleased with the news. His remarks from the press release: "I want to thank Robert De Niro, Jane Rosenthal and the Tribeca Film family for all of the love and support they've given Time Is Illmatic. It is an honor to be in partnership with them. I feel there is a cultural kinship bonded by the city of New York." Pretty awesome news. I'll keep you posted as I receive more information.